Actor Michael Fassbender, star of movies such as “Steve Jobs” and the new “Alien: Covenant,” recently traded the film set for the race track to complete his first race in the one-make Ferrari Challenge series. Fassbender, a lifelong fan of Formula One and Ferrari itself, began training with the Italian firm’s Corso Pilota driving program in 2016. 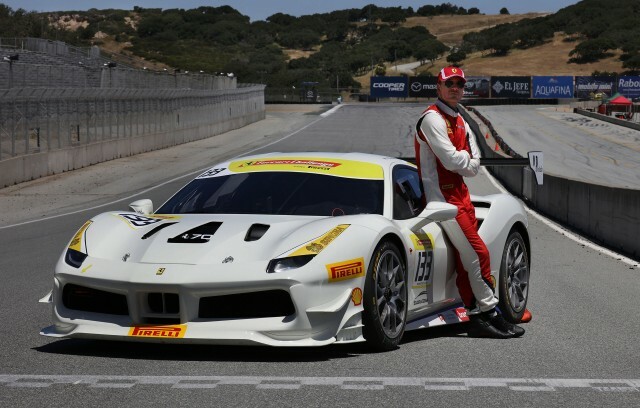 His first race was during the opening round of the 2017 Ferrari Challenge held at Laguna Seca this past weekend. In his final event of the day he managed to finish sixth in class. Fassbender has said he plans to take part in “four or five” rounds this season. The car used in the 2017 season of the Ferrari Challenge is the 488 Challenge. It is designed specifically for the series and is based on the road going 488 GTB. Not only is it Ferrari’s most powerful entrant in the series to date, the engine is nearly identical to the 488 GTB, too. The key difference between the factory 3.9-liter twin-turbocharged V-8 and the race car’s mill is different mapping for improved top-end performance. After all, these cars spend a lot of time at their limits. There’s also plenty of aerodynamic bits to help keep the race cars as slippery as possible. Fassbender isn’t the only star to get behind the wheel of a race car in recent times. In 2013, “Grey’s Anatomy” star Patrick Dempsey raced the 24 Hours of Le Mans with a Porsche 911 GT3 RSR. All the Major Browsers Will Soon Block Flash, is Your Website Ready?